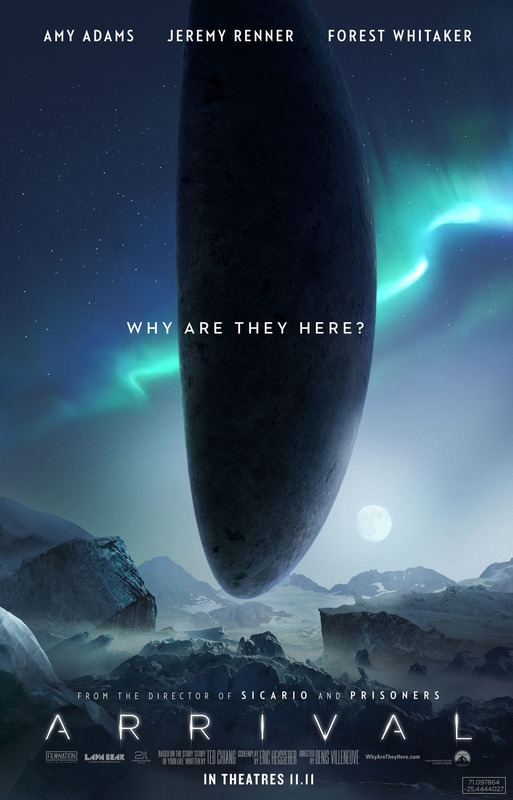 Synopsis: When 12 alien ships mysteriously appear in places around the world, a team of experts are gathered to assess the extra terrestrial visitors, and to determine: just why are they here? Review: Alien invasion, a classic trope of the science fiction genre, One that so often delivers films where you sit back and just watch a load of mayhem and destruction with cities getting blown to smithereeens and the aliens must be stopped at all costs. While these can be fun and very enjoyable, science fiction is a genre that has the potential to go really deep and provide the audience with a thought provoking piece of story telling that gets the brain working and leaves its audience in awe and spectacle, and this latest film from director Denis Villeneuve ticks that box, and then some. Adapted from the short story Story of Your Life by Ted Chiang, with a screenplay by Eric Heisserer, we focus on Dr Louise Banks (Adams) a brilliant linguistics professor who is called in by the US military to help deal with the mysterious alien invaders and to understand just who are they, what do they want, and above all are they a threat to humanity? Aiding her in her quest is physicist Ian Donnelly (Renner) and together these intelligent academics must decipher what these extra terrestrial beings are up to. Heisserer’s screenplay is excellent, exploring some really interesting themes that we have seen before in science fiction. Yet these are told in such a brilliant and engaging way that it keeps your eyes firmly transfixed on the screen. The mystery is maintained throughout the film’s running time as for a while, the craft of the visitors is not revealed, and it brilliantly keeps the viewer engaged. It is smart and very thought provoking story-telling that keeps you hooked from the very first shot, all the way to the last shot. The centrepiece of this story is of course Adams’s Dr Banks, a wounded soul who has suffered some terrible tragedies in her lifetime, and yet, she remains strong willed, determined to do all she can to understand what the alien visitors are after, and not to bow to the will of her military superiors, most notably Forest Whitaker’s Colonel Weber. Adams has had a very distinguished career, earning five Oscar nods, and another one could very well be coming her way next year. She carries the film on her shoulders, and reinforces her reputation as a very stellar actress. Renner also gives a very grounded and superb performance, who does his best to sprinkle a bit of humour here and there into the story, but the limelight belongs to Adams and she absolutely bosses it. The directing from Villeneuve is masterful in its execution, aided by flawless cinematography from Bradford Young. The wide shots of the alien craft as they appear in the sky are truly something to behold. The flawless cinematography is aided by outstanding visuals and magnificent visual effects. The aliens themselves feel so real and authentic, you don’t see it as a computer generated image. Similarly with the alien crafts, though they do resemble pieces of a Terry’s Chocolate Orange, are beautifully designed and like their inhabitants feel very real and authentic. Re-teaming with Villeneuve after Sicario, Jóhann Jóhannsson’s score is mesmerising to the ears, as Villeneuve’s visual brilliance is appealing to the eyes. Language and science are two subjects that rarely go hand in hand, but here they most certainly do and the results are a joy to behold. The mystery will hook you in and will not let go. With the Blade Runner sequel being Villeneuve’s next film, fans of Ridley Scott’s classic can rest assured knowing that project is in very safe and capable hands. 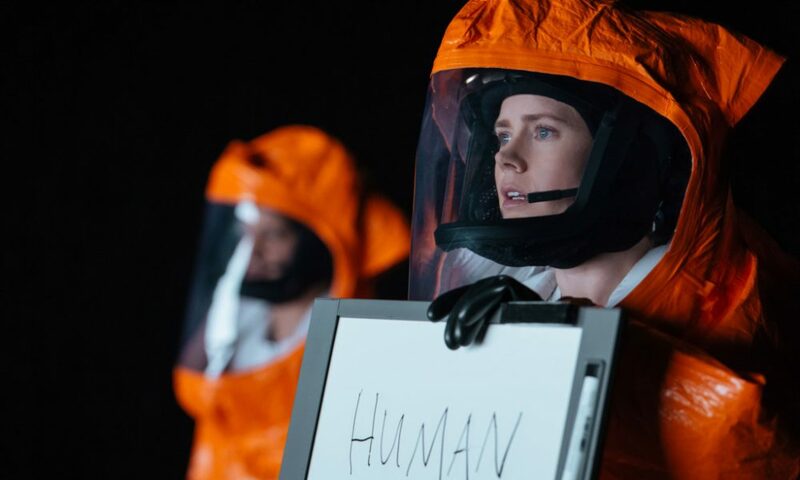 A beautifully refreshing take on what is a very common sci-fi trope, with thought provoking themes and ideas, anchored by a powerful performance from Adams. We saw exactly the same film here, my friend. that we did dude!! So excited to see what Denis does with the Blade Runner sequel this year! If nothing else, we know we’ll get something visually sumptuous. Looking forward to more Denis. He will win an Oscar one day, I’m sure of that!